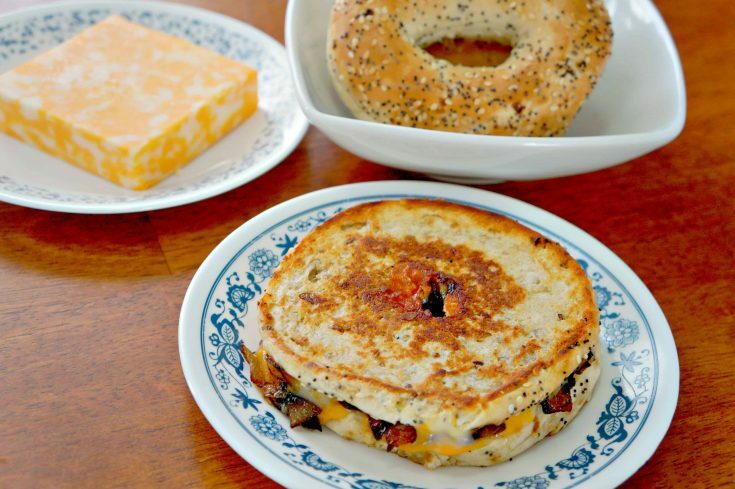 This Everything Bagel Grilled Cheese is the perfect easy lunch idea. This delicious sandwich comes together quickly and is packed with flavour. Two of my favourite lunch foods are grilled cheese (all the different grilled cheese recipes on the blog probably gave that away already!) and everything bagels. Usually I use the everything bagels to make tomato sandwiches but today I decided to try something a little different and turn my bagel into a grilled cheese. I started by frying up some diced onions until they were nicely browned. Then I buttered the cut sides of the bagel. I buttered the cut sides because I decided to turn the bagel inside out for the grilled cheese so that all the seeds wouldn’t fall off and I would have a flatter surface against the pan for cooking. I placed one half of the bagel buttered side down in the frying pan and placed a slice of cheese on top. I used marble cheese slices for my sandwich but you could use whatever cheese you like. Then I put the fried onions on top followed by another slice of cheese. I placed the other half of the bagel buttered side up on top of everything and let the sandwich cook until the bottom was nicely browned. Then I flipped the sandwich and cooked the other side. This grilled cheese turned out great. The bagel gets nicely toasted and the cheese perfectly melted. The everything bagel seasonings really add flavour to the sandwich. You’ll want to enjoy this sandwich while it’s still hot to get the cheese at its perfect gooeyness. Try this recipe out when you are looking for a tasty lunch that is easy to make. 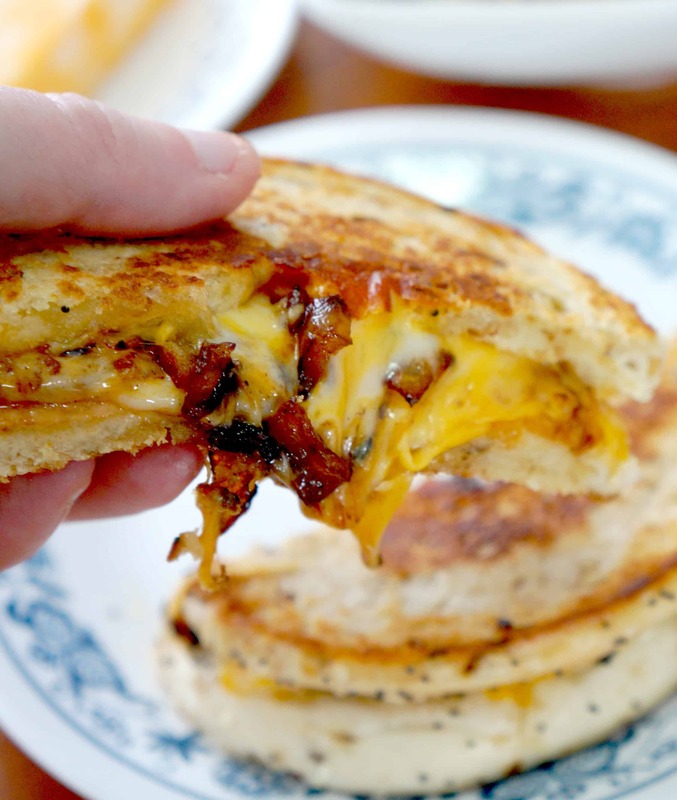 If you are looking for some more grilled cheese recipes check out Waffled Grilled Cheese, Bacon and Banana Peppers Grilled Cheese and Pepperoni Pizza Grilled Cheese. This everything bagel grilled cheese will be your new favourite sandwich. 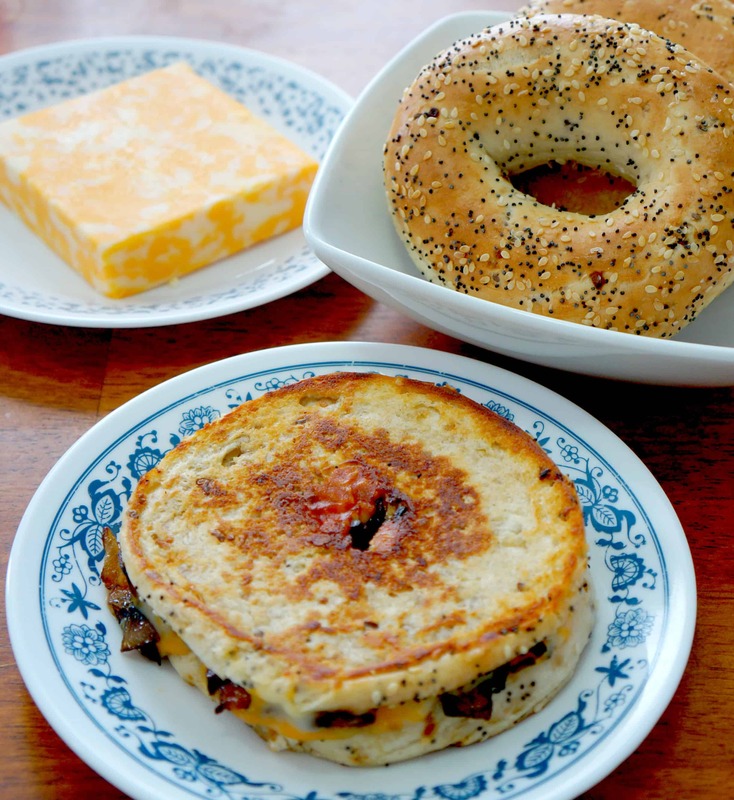 The grilled cheese bagel is loaded with fried onions. Fry onions with a tbsp of butter in a small pan over medium heat until nicely browned (about 5 minutes). Preheat another small frying pan on medium heat for the grilled cheese. Butter the cut sides of the bagel. Place one half of the bagel buttered side down in the frying pan and flatten down a bit with a spatula. Top with one slice of cheese followed by the onions and another slice of cheese. Place the remaining bagel half on top buttered side up and then flatten the whole sandwich with the spatula. Allow the sandwich to cook until the bottom is golden brown (about 2-3 minutes). Flip the sandwich and brown the other side.